Memorial services for Leila Kothrade will be held on Saturday, January 26th a 2 PM at First Lutheran Church in Baudette. Visitation will be on Friday evening from 5-8 PM with an 8:00 prayer service at Helgeson Funeral Home in Baudette. Interment will be at the Elm Park Cemetery at a later date. Florence Leila Dahl – Mollberg – Kothrade was born on February 8th, 1935 in Hiwood, MN (Forest area) to Alf and Elsie Dahl. She grew up in the Norris camp area before moving to Spooner and later Pitt. She attended school in Spooner and in Baudette, where she played GAA basketball. She then went on to attend college in Ellendale, ND where she got her teaching degree and later taught school in Ashley, ND. She missed teaching but once said “We are not in control of our destiny; the lord guides us and he guided me to Molly and my family and to Chuck and his family”. Leila was a book keeper for the Baudette Creamery, the old bowling alley, Dodds Lumber Company, and the Golf Course. Later she went on to work at Bell Telephone Company for 9 ½ years. She was the first woman installer in the district. After Bell, she began her adventures with Chuck at the bowling alley and Dana’s store. In 1955 Leila went to a dance in Carp, where she met Marvin (Molly) Mollberg. They eloped to Siston, SD and were married on May 8, 1956. Molly sadly passed away in 1976. Leila met Charles (Chuck) Kothrade in 1979. They were married in Baudette on April 26th, 1980. She once said, “The lord must love me a lot to have given me two wonderful marriages”. Leila was quite the social butterfly, while working at Bell telephone, instead of taking her coffee breaks at stores she would do it at a friend’s house or shut ins. She started the “Cloverleaf Coop Bowling Team”, with her beloved friends Gail and Gladys and bowled 29 years teaming up with her friends throughout the years. 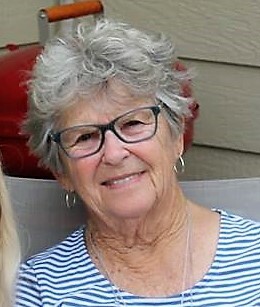 While working at the golf course, she decided to learn the game and started in 1970 and continued to play throughout her life. She was quite the” Producer” creating and putting on many skits for bowling, golfing, birthday parties, and church lunches. Leila wrote a book called, “Nobody Knows It But Me”. Her last sentence in the book reads “There comes a time when enough is enough and I have reached that time… there are more things I could say and things I could have said but in the words of bugs bunny, th-th- that’s all folks. Love you all”. Leila is preceded in death by her father, Alf Dahl, mother Elsie Dahl, husbands, Molly Mollberg and Chuck Kothrade, brothers, Julius, Gordan and Olaf Dahl, daughter, Michelle Praytor and grandson Tanner Mollberg; infant, granddaughter, Bailey Mollberg. She is survived by her brothers, Ivan (Charolette) Woody (Peachie), and Dennis Dahl, children, Mary Fisher, Michael Mollberg, Marty Mollberg, Mavis (Don) Bentley, Glen Praytor, Melinda (Glen) Grubbs, Matthew (Susan) Mollberg, Paula Kothrade, Tom (Diane) Kothrade, Nanci Kothrade-Miller, daughter in law, Julie Mollberg. Grandchildren, Skylar (Kaila) Fisher, Erin Mollberg, Blake, Brady, Molly, Brett Bentley, Robbie Praytor, Elijah (Natalie) Grubbs, Jamie (Danny) Mollberg, Travis (Taylor) Mollberg, Brian Thompson, Blaine Thompson, Carrie (Ray) Schultz, Sam Kothrade and great grandchildren, Madison, Miley, and Kasen Fisher, Jamey and Georgia Bentley, Clayton Praytor, Tatum and Tesla Mollberg, Alex Hawk, Ella and Izzy Schultz. In Lieu of flowers, donation to the Baudette Depo and First Lutheran Church.